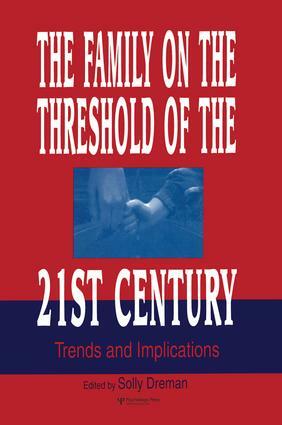 Is there life for the family in the 21st century? Pessimists view the traditional two-parent nuclear family as a relic of the past, attributing their gloomy outlook to increased demands from the workplace, rampant technological advancement, and the pursuit of personal achievement at the expense of interpersonal needs and values. Optimists, on the other hand, claim that increasing alienation and emphasis on the occupational sphere necessitate a sense of family, community, and belonging as a haven from work-related stress. This volume addresses these and related issues such as the interplay of personal versus interpersonal factors in family development, the role of the extended family, and the interface between work, community and family. The contents of this book--scholarly contributions from a unique interdisciplinary rostrum of behavioral scientists in such diverse fields as psychology, sociology, anthropology, social work, industrial management, and demography--represent the latest developments in research, theory, and practice in family studies. The reader is presented with theoretical formulations, empirical findings, and applied interventions regarding family life in different parts of the world. A systems perspective is adopted as the family is examined at its interface with individuals, community, society, and culture, with the interdependence of these different levels emphasized. In addition, an attempt is made to integrate the work of theoreticians, researchers, and practitioners in understanding the evolving family. Dreman provides a survey of family life in the international arena and finds a surprising consensus between the different disciplinary perspectives and the respective geographical arenas. He discusses life-span issues in relation to all levels of family life including the impact of increased longevity and decreased fertility in relation to topics such as individual development, parent-child and couple relationships, the workplace, and the community. This book also highlights the interplay of biological and interpersonal dynamics as in the case of spousal depression.